Part of what makes Japanese cuisine so enjoyable is that so much effort goes into the presentation, as the belief is that food should not only be pleasing to the palate but also enjoyable to the eyes. The town of Inakadate in Aomori Prefecture takes this to the ultimate extreme as some of its rice looks beautiful even its growing. 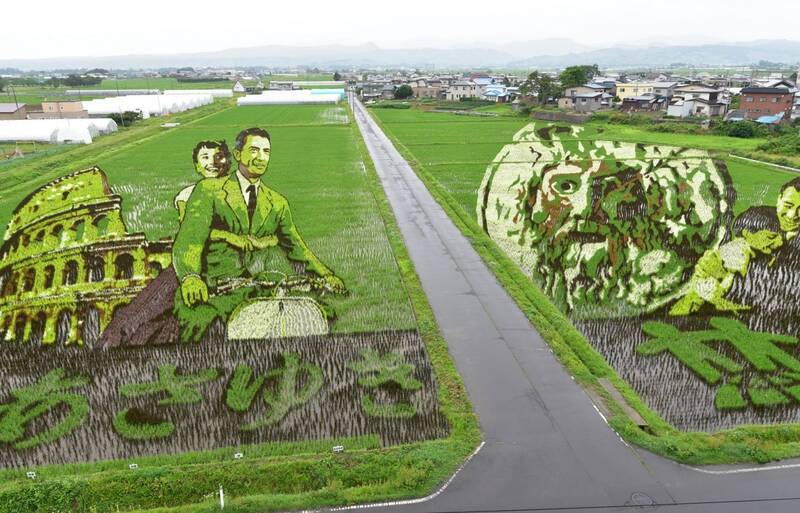 Each year, a pair of the Aomori Prefecture town’s fields are used to create amazing rice paddy art (or tambo art, as it’s called in Japanese). With summer here, this year’s designs have reached their best viewing season, and the project’s organizers and visitors have been sharing photos online, enticing visitors to make the tip up to the northernmost prefecture of Japan’s main island of Honshu. This year, the project tips its hat to two beloved stories from the 1950s. In Field #2, Atom/Astro Boy, the iconic robot hero created by “God of Manga” Osamu Tezuka, strikes his signature pose as part of a salute to the extended pantheon of Tezuka characters. Meanwhile, in Field #1, Audrey Hepburn and Gregory Peck zoom off on a Vespa, then share a tender moment in front of the Mouth of Truth as part of their Roman Holiday. As breathtakingly detailed as the artwork looks from above, at ground-level it can initially look just like a haphazard field of different strains of rice. From the viewing platforms, though, it becomes clear that each and every stalk of rice was planted in a specific location to create the stunning agricultural mosaics. For those interested in seeing the astonishing sight with their own eyes, the closest stations are Inakadate Station and Tambo Art Station, the latter of which was specifically constructed to help travelers coming to see the fields. A free shuttle runs between Tambo Art Station and the fields, with departures roughly once an hour (schedules here and here). There’s also a “stone art” installation, with a likeness of Princess Diana next to Astro Boy, as well as one of Japanese singer Hibari Misora. The organizers say the artwork is now in its optimal viewing condition, and will continue to be so until the middle of August. However, photos from 2017 show that as it gets deeper into fall, the rice paddy artwork changes hues, with an evolving aesthetic that gives each month its own unique charm. Pictured above, the characters, Scarlett O'Hara and Rhett Butler embrace one another from the movie, Gone with the Wind. The photo was taken on July 30th. However, by October 8, 2017, the vibrant lush green fields turned to a mustard yellow and dusty brown field—thereby more closely resembling the hues of original photo that features a burning house in the background. You won't want to wait too long, since the last day to view this year’s rice paddy art, prior to harvesting, will be October 8, 2018.